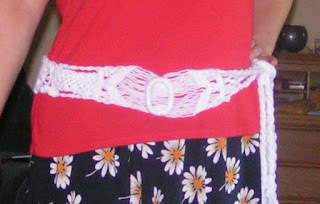 The Bobbilicious Files: I Love Macrame! It isn't great because I used yarn (stash-busting) and haven't knotted in a long time, but I'm pleased with how it came out. It's very summery. I hope to get lots of wear out of it. I took a cleaning break this afternoon to sort out a bag of embroidery floss from the auction. I haven't done any in quite a long time but recently I won an embroidery book! I'll take some pictures and tell you about it tomorrow because it's really cool. I have a whole sewing and embellishing project in my head. Let's see how long it takes to actually get done...heh heh.